On May 18, 2018 the International Conference “Cooperation of Universities and Employers for Quality and Relevance of Education” took place. The organizer was the Saint-Petersburg State University of Economics (UNECON). 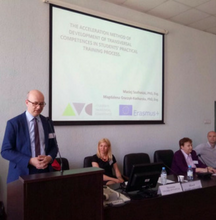 The conference was an integral part of Erasmus+ Jean Monnet Project. The project is dedicated to research of the European HEIs’ experience in cooperation with employers and policy makers and dissemination of the accumulated knowledge. The guests were greeted by PhD. Elena Viktorova, the coordinator of the IAC SPbSUE project. The main goal of the project is to facilitate a dialogue between all actors of educational process of tertiary level. 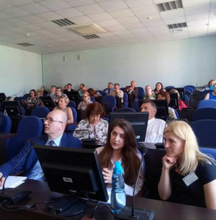 The event was attended by teachers, administrative officers, researchers, representatives of business, educational authorities, public administrators and civil society representatives. PhD. Eng. Maciej Szafrański and PhD. Eng. 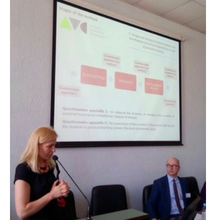 Magdalena Graczyk – Kucharska, scientists from the Faculty of Engineering Management at the Poznan University of Technology, presented the project „The acceleration method of development of transversal competences in the students’ practical training proces”. – We are grateful for the invitation. The meeting was a great opportunity to discuss issues related to the quality of education and the possibility of establishing cooperation – says PhD. Eng. Maciej Szafrański, Faculty of Engineering Management.